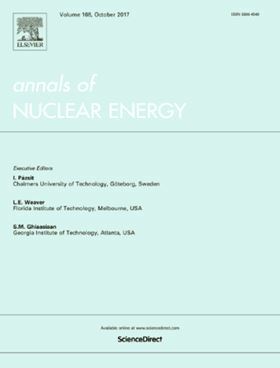 Elsevier journal Annals of Nuclear Energy. The cavitation performance of the centrifugal pump depends significantly on geometrical traits of the impeller blade. An investigation is performed on the centrifugal condensate pump which is featured by operating under cavitation condition. Both experimental and numerical techniques are utilized. Three impeller schemes are devised to improve the cavitation performance. Pump head, cavitation and flow parameter distribution are investigated systematically. Experimental results show that the impeller with five long and five short blades possesses the smallest critical value of net positive suction head at rated flow rate. It is further proved that this impeller maintains the most desirable cavitation performance over the entire flow rate range. Both hydraulic and cavitation performance of the impeller equipped with nine blades of three kinds of length are low relative to the other schemes. Cavities in the pump impeller are produced at the suction side of long blades and approaching the blade inlet, while cavities are absent near the inlet of the short blades. The correlation between pressure distribution and cavitation is manifested at impeller inlet. Long blades contribute to the enhancement of flow uniformity, but the low-pressure area immediately upstream of the blade inlet is enlarged due to narrowed inter-blade area, as is evident in the three pump impellers.